The Frighteners wasn’t a huge hit when it was first released. Audiences at the time didn’t really know what to make of it. It was horror, but it was comedy, and it was straddling both genres throughout its entire runtime. It actually took a long time for this one to gain a fan base. Even I have to admit that I wasn’t sure what to make of it when I first saw it. The serious stuff went over my head but I loved the more slapstick elements of it. Then, when I revisited it as a teen, the serious moments were all I was interested in and the offbeat humor just seemed juvenile to me. Which, I think, simply comes down to being a teenager. 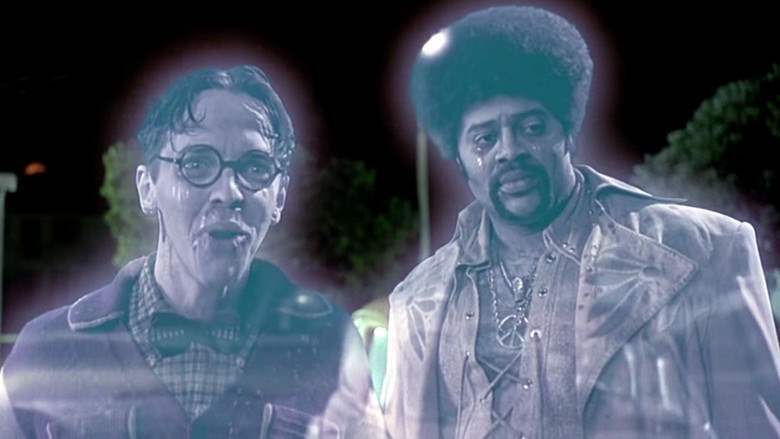 The film didn’t really take many risks that weren’t previously taken by Evil Dead 2, but the big difference is that The Frighteners was made for a whole lot more money, and I think that’s why it was perceived as a failure at the time. Even now, people will complain about the effects. The Frighteners had, at the time it was released, more digital effects shots than any other movie in history. Sometimes they work, sometimes they don’t. And even those that don’t hold up still kind of look great to me. The digital Grim Reaper is not a great digital creature by today’s standards, but I loved it at the time. It was more or less what I imagined the Reaper to look like when I was a kid. I caught a glimpse of it on TV and that was what first got me interested in seeing the movie. It was a creepy image, and the formlessness of the design still impresses me. People like to harp on the effects as a reason why this film is a failure, and that makes no sense because all of that FX work is ambitious as hell. With the amount of digital composite shots in this feature, some are bound to work better than others. There are a couple of missteps, but they never completely fall and the movie does anything but crumble underneath them. Here’s what I love about The Frighteners: it was Peter Jackson making a Peter Jackson movie. It’s as simple as that. He made weird, hilarious counter-culture horror films in New Zealand and that garnered him some attention, so eventually he was asked to come do it in America for a lot more money. But when he did The Frighteners, he actually seemed to have left those types of features that put him on the map behind, at least to some extent. By the time he was offered this, he’d just made a change of pace with Heavenly Creatures. And even with a major US studio looking over his shoulder, even with a budget exponentially bigger than anything he’d worked with before, he made the exact kind of horror film he’d been making in his home country. He never once sacrificed his style for the sake of a new audience, or for the film’s producers. It seems very easy and obvious to say that he made it a Peter Jackson movie, but the fact that it is one is no small miracle. The Frighteners, in terms of the humor and the pacing and the visual style, fits right in beside the likes of Braindead and Bad Taste. But it also has an emotional depth that, juxtaposed with the sight gags and the hijinx, make for a really interesting, entertaining ride. There’s a lot of over-the-top acting that’s all very intentional on the part of the director and orchestrated in such a way that it’s never too much. It’s always just over-the-top enough. But there’s also some surprisingly serious acting as well. As much as it is a comedy, The Frighteners is inherently about coping with death. With that in mind, Michael J. Fox gives an incredibly strong performance. As funny as he gets to be, this is still one of the most serious roles I’ve seen him tackle and he does it exceptionally well. Frank Bannister spends his life surrounded by ghosts. He can’t control his abilities, so his whole life is spent in the presence of the undead. Yet Frank still refuses to cope with the death of his wife. He can’t see her, she’s passed on, and he was blamed for her death, so it’s an almost impossible situation he finds himself in. I think people tend to forget how serious the movie can be when it wants to. And it takes a lot of control to know when to play up the laughs and when to have those strong, emotional moments. It’s not remotely easy to do. That’s why I would honestly go as far as to say that The Frighteners is one of Peter Jackson’s most well-rounded films. You can tell while watching it that the director knew exactly what he wanted this feature to be and never once compromised in that. The supporting cast is rounded out with some of horror’s biggest names, too. Honestly, that alone should be enough of a reason for more fans to go back and give this one another look. Jeffrey Combs is in a much bigger film here than most genre buffs are probably used to seeing him in, but he’s cast for his ability to make B-Movies shine with the weird, quirky performances he always manages to deliver. And this performance is both his weirdest and quirkiest. It’s no wonder that, if people only remember one thing about this movie, Milton Dammers is always it. Jake Busey hams it up almost as if he was auditioning to replace Englund in Freddy’s Nightmares, but he gets some actually creepy moments. All of the flashbacks to Johnny Bartlett’s murder rampage are unsettling because they feel genuine. Even if those moments are heightened and somewhat played for absurdity, they feel like dramatizations of scenes pulled from a true crime book—probably one on Starkweather. It’s impossible to talk about the cast, though, without mentioning the unsung hero of The Frighteners. Dee Wallace is so good in this movie and she never seems to get any of the credit for it. That alone might be good enough reason to go back and give it another watch. She’s amazing. Wallace plays so against type and it was genius on the part of Peter Jackson to even think to cast her. First off, you have the quintessential movie mom now playing a daughter who refused to grow up. She’s stunted and you’re led to think it’s because of a trauma, when in actuality it’s because she’s been waiting a very long time to pick up where she left off. There’s so much sympathy for her character throughout the early portions of the movie and that’s genius because once we hit that reveal, she comes unhinged. Wallace always plays these sweet, maternal roles and her character in The Frighteners is just evil. She’s not the battered, abused sidekick to Bartlett, she’s not suffering from Stockholm Syndrome and she doesn’t think she can change him. She’s attracted to him because her only source of excitement, her only sense of sexuality—at least that we see—comes from taking the life of a human being. He happens to be very good at that and so they are destined to be together. The Frighteners has a lot to offer. While it has its fans, they’re not overly vocal, and more than anything else a lot of people simply tend to forget about it. If you missed it or never got around to seeing it, track it down. It’s not hard to find. If it’s been a while, go back and give it another shot. I think you’ll be glad you did.